The human hand is made up of the wrist, palm, and fingers and consists of 27 bones, 27 joints, 34 muscles, over 100 ligaments and tendons, and many blood vessels and nerves. The hands enable us to perform many of our daily activities such as driving, writing and cooking. It is important to understand the normal anatomy of the hand to learn more about diseases and conditions that can affect our hands. The wrist is comprised of 8 carpal bones. These wrist bones are attached to the radius and ulna of the forearm to form the wrist joint. They connect to 5 metacarpal bones that form the palm of the hand. 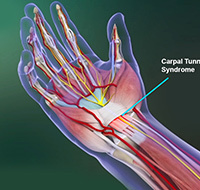 Each metacarpal bone connects to one finger at a joint called the metacarpophalangeal joint or MCP joint. This joint is also commonly referred to as the knuckle joint. The bones in our fingers and thumb are called phalanges. Each finger has 3 phalanges separated by two interphalangeal joints, except for the thumb, which has only 2 phalanges and one interphalangeal joint. The first joint close to the knuckle joint is called the proximal interphalangeal joint or PIP joint. The joint closest to the end of the finger is called the distal interphalangeal joint or DIP joint. The MCP joint and the PIP joint act like hinges when the fingers bend and straighten. 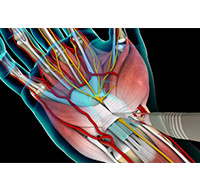 Our hand bones are held in place and supported by various soft tissues. These include: articular cartilage, ligaments, muscles and tendons. Articular cartilages are smooth material that act as shock absorbers and cushion the ends of bones at each of the 27 joints, allowing smooth movement of the hand. Muscles and ligaments function to control the movement of the hand. Ligaments are tough rope-like tissues that connect bones to other bones, holding them in place and providing stability to the joints. Each finger joint has two collateral ligaments on either side, which prevents the abnormal sideways bending of the joints. The volar plate is the strongest ligament in the hand. It joins the proximal and middle phalanx on the palm side of the joint and prevents backwards bending of the PIP joint (hyperextension). Muscles are fibrous tissues that help produce movement. Muscles work by contracting. There are two types of muscles in the hand, intrinsic and extrinsic muscles. 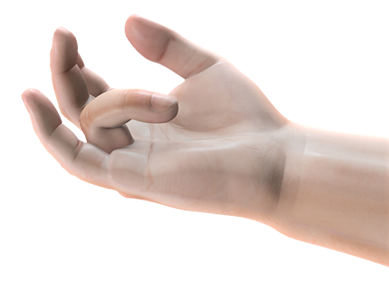 Intrinsic muscles are small muscles that originate in the wrist and hand. They are responsible for fine motor movement of the fingers during activities such as writing or playing the piano. Extrinsic muscles originate in the forearm or elbow and control the movement of the wrist and hand. These muscles are responsible for gross hand movements. They position the wrist and hand while the fingers perform fine motor movements. Each finger has six muscles controlling its movement: three extrinsic and three intrinsic muscles. The index and little finger each have an extra extrinsic extensor. Tendons are soft tissues that connect muscles to bones. When muscles contract, tendons pull the bones causing the finger to move. The extrinsic muscles are attached to finger bones through long tendons that extend from the forearm through the wrist. Tendons located on the palm side help in bending the fingers and are called flexor tendons, while tendons on top of the hand help in straightening the fingers, and are called extensor tendons. Nerves of the hand carry electrical signals from the brain to the muscles in the forearm and hand, enabling movement. They also carry the senses of touch, pain and temperature back from the hands to the brain. The three main nerves of the hand and wrist are the ulnar nerve, radial nerve and median nerve. 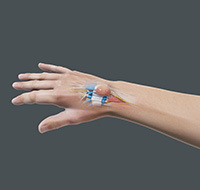 All three nerves originate at the shoulder and travel down the arm to the hand. Each of these nerves has sensory and motor components. Ulnar Nerve: The ulnar nerve crosses the wrist through an area called Guyon’s canal and branches to provide sensation to the little finger and half of the ring finger. Median Nerve: The median nerve crosses the wrist through a tunnel called the carpal tunnel. The median nerve provides sensation to the palm, thumb, index finger, middle finger, and part of the ring finger. Radial Nerve: The radial nerve runs down the thumb side of the forearm and provides sensation to the back of the hand from the thumb to the middle finger. Blood vessels travel beside the nerves to supply blood to the hand. The main arteries are the ulnar and radial arteries, which supply blood to the front of the hand, fingers, and thumb. The ulnar artery travels next to the ulnar nerve through the Guyon’s canal in the wrist. The radial artery is the largest artery of the hand, traveling across the front of the wrist, near the thumb. Pulse is measured at the radial artery. Other blood vessels travel across the back of the wrist to supply blood to the back of the hand, fingers and thumb. Bursae are small fluid- filled sacs that decrease friction between tendons and bone or skin. Bursae contain special cells called synovial cells that secrete a lubricating fluid. Ganglion cysts are swellings that most commonly develop along the tendons or joints of wrists or hands. They can be found either at the top of the wrist, palm side of the wrist, end joint of a finger or at the base of a finger. Ganglion cyst is not cancerous and will not spread to the other parts of the body. It looks like a water balloon on a stalk and contains a clear fluid or jelly material. Ganglion cysts can be found in people of all ages. Dupuytren’s Contracture is a hand condition where thickening of the underlying fibrous tissues of the palm causes the fingers to bend inward. Patients with this condition are unable to fully straighten the affected fingers. Ganglion cysts are fluid-filled lumps that most commonly develop along the tendons or joints of wrists or hands. It looks like a water balloon on a stalk and contains a clear fluid or gelatinous material. 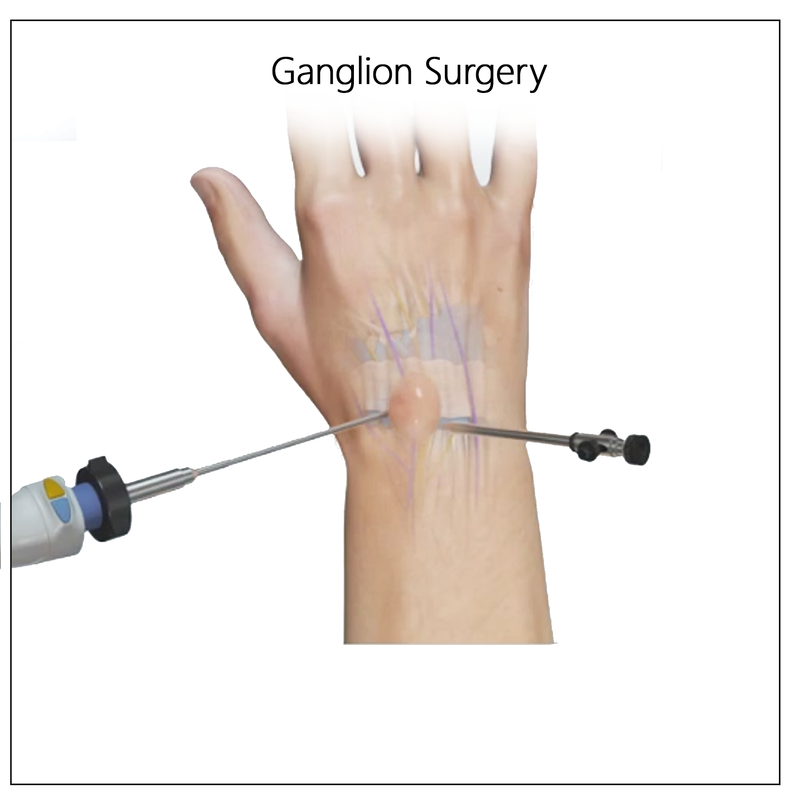 Ganglion cysts are noncancerous, generally harmless and disappear without any treatment. However, if the cyst becomes painful or interferes with hand movement, they can be treated non-surgically or removed surgically.